Low Rates, Great Benefits, Apply Today! Are you a candidate for an cuGrad Student Loan Consolidation? If you are looking for specific information related to a particular area of student loan consolidation the following list might be of use to you. Student Loan Consolidation Interest - Former students may have the ability to pay only one payment every month and secure lower interest rates through the use of loan consolidation. Whether through a private or government loan, those who meet the certain qualifications could make repaying loans much more manageable in the future. Student Loan Consolidation Rates 2012 - Consolidation rates are lower now than in years past, and as a result both federal and private student loans have become increasingly popular. In addition to lowering monthly payments and interest rates, student loan consolidation offers additional forbearance and deferment time. Student Loan Consolidation Service - There are several different kinds of student loan consolidation including federal, commercial, and the cuGrad Private Student Loan Consolidation. Each service provides assistance for students with debt depending on their different needs and qualifications. Student Loan Consolidation Compare - Before choosing a consolidation plan, explore the many options available to find the one that best fits your needs. Don’t hesitate to contact various consolidation companies to see what different options they offer. Direct Student Loan Consolidation - Direct student loan consolidation varies from federal aid in that federal loans do not require credit checks or cosigners. cuStudentLoans.org only consolidates private student loans, meaning that all loans are written by banks, credit unions, and other non-federal lending institutions. Government Student Loan Consolidation - For those currently with payments of more than they can afford, federal student loan consolidation could be the answer. In most cases, you’ll enjoy lower payments and possibly even lower interest by making one unified payment. Private Student Loan Consolidation Companies - Private student loan consolidation companies can help provide the opportunity to refinance student loans and create an appropriate payment plan. There are not many to choose from and there are important things to know about each type of company. Can You Refinance Student Loans? - If you have been wondering if you are able to refinance your student loan you can find the answer as well as a thorough explanation here. 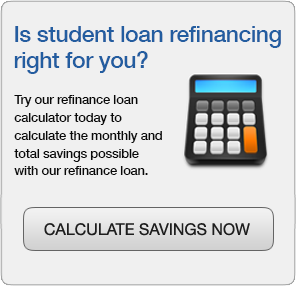 Refinancing Student Loans - Here we explain how you can refinance your student loans. We also cover why you may went to refinance and what the positive and negatives are of the process. Refinancing Private Student Loans - What is the difference between a government and private student loan? Here we explain how you can refinance a private student loan and why you might choose to do so. How to Refinance Student Loans - This page explains how to refinance your student loans. We also explore why you might want to refinance and why you possibly would not want to. Law Student Loan Consolidation - Law student loan consolidation is a great way to combine one’s loans into an easy, single monthly payment. Each party must consolidate law school loans individually, and standard repayment begins within sixty days. Medical Student Loan Consolidation - By working with cuStudentLoans.org, one can simplify his or her financial life with medical student loan consolidation. Paying off this loan as soon as possible is the best way for medical students to maintain positive credit while building their careers. *Subject to lender approval. Borrower must meet lender's credit and income requirements. **Subject to a 3.75% floor rate. Requires continued enrollment of automatic payments. If the automatic payment is cancelled at any time after enrollment, the rate reduction will discontinue until automatic payment is reinstated. May be suspended during periods of forbearance and deferment. Try our consolidation loan calculator today to calculate the monthly and total savings possible with our consolidation loan.